A must-have in any restaurant, buffet, or catered event, the Cal-Mil 1010 Stainless Steel Acrylic Beverage Dispenser with Ice Chamber 2 Gallon stylishly serves water, iced tea, or colorful punches. Featuring a high quality acrylic container, this beverage dispenser provides unbeatable durability while its crystal clear surface offers excellent product visibility. To keep beverages ice-cold for hours, this dispenser is designed with an ice chamber. 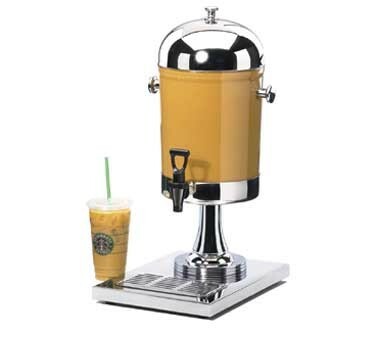 Thanks to its stainless steel base and lid, this rust-resistant dispenser adds modern elegance to any setting. For maximum convenience, this beverage dispenser is built with a drip-tray to minimize mess and a removable spigot for easy cleanup.